"Without being eternal, nobody can serve the eternal. That is the Vedic injunction. Without becoming Brahman, one cannot approach the Supreme Brahman. Just like without being fire, nobody can enter into the fire. Without being water, nobody can enter into the water. Similarly, without being fully spiritualized, nobody can enter into the spiritual kingdom. So nitaiyer carana satya. If you catch nitaiyer, the lotus feet of Nityananda, then you become immediately spiritualized. Just like if you touch electricity, immediately you become electrified. That is natural. Similarly, Nityananda is eternal happiness, if you touch Nityananda some way or other, then you become also eternally happy. Tanhara sevaka nitya. 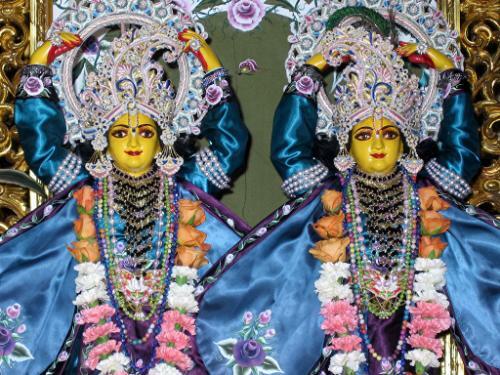 Therefore one who has in contact with Nityananda, they have become eternal."